U.S. investors betting on an epic U.S. style housing bust occurring in Canada have been doing so for a considerable period with no clear proof. Claims of a broad-economy wide housing bubble that is ready to burst are significantly overstated with no clear evidence that a bubble exists. The majority of price growth is coming from Vancouver and Toronto and there are specific reasons supporting higher prices in those markets. The conditions in Canada’s housing market are strikingly different compared to those that existed in the U.S. during the lead-up to the 2007 housing meltdown. It appears that ‘group think‘, ignorance and cognitive dissonance have come to dominate the argument around whether Canada’s housing market is in bubble territory and poised to burst sometime soon. Struggling U.S. hedge funds, many of which missed out on the ‘big short‘ of book and movie fame, have been betting heavily on an epic Canadian housing meltdown by shorting Canada’s major banks, but to date have incurred considerable losses. Then you have the chorus of economists, analysts and investors who have been claiming that not only has a massive real estate bubble formed in Canada but that it is poised to burst. In many cases, these proclamations go back as far as 2009 and despite being reiterated by naysayers now for close on seven years, a housing bust has yet to occur. Many including acclaimed investor Canada’s own Prem Watsa have stated that Canada’s housing market resembles that which existed in the U.S. during the run-up to the subprime crisis. the growing risk of external economic shocks. However, it appears that many investors, particularly those based in the U.S. are ignoring the fundamental differences between the two markets and local attributes that will not only prevent an epic meltdown but backstop prices for some time to come. Let’s take a detailed look at some of the major myths that are regularly wheeled out by those who claim that a massive housing bubble exists in Canada and is poised to burst any time. One of the main drivers of the massive U.S. housing meltdown was that frothy prices were not restricted to specific regional markets or segments but instead constituted an economy-wide housing bubble that was highly speculative in nature. And the risk that this posed to the U.S. financial system and economy was magnified by the prevalence of non-traditional and substandard lending practices as well as considerable volumes of inferior mortgage backed securities. Yet in the case of Canada, overheated or bubbly housing markets are restricted to a small number of regional markets and market segments, with the growth of housing prices either slowing or falling across other regions. By the end of June 2016 it was only a handful of markets including Toronto, Vancouver and Hamilton-Burlington that experienced double-digit growth. In fact, it was the considerable increase of house prices in those markets which for June rose by 16.8%, 11.4% and 14.2% year-over-year respectively, which was responsible for the Canadian national average growing by 11%. Other regional markets such as New Brunswick and Quebec grew at more modest rates of around 3%, whereas Novia Scotia remained flat. Then you have Alberta and Saskatchewan, which are among the most affected by the prolonged slump in crude, where house prices fell by 1.4% and 1.6% respectively. It is these points which indicate that Canada’s housing market on whole, is starting to cool with the growth in the national average house price predominantly being driven by Toronto and Vancouver. This does not necessarily mean that either of those housing markets have entered bubbles with a range of market specific dynamics responsible for the ongoing price growth. Probably one of the biggest myths regularly bandied about by those that claim the market is in rarefied bubble territory and ready to burst, is that the tremendous inflow of foreign investment, particularly from China, is driving prices to unrealistic levels, particularly in Toronto and Vancouver. While it is certainly undeniable that these markets are attracting considerable amounts of attention from foreign investors this is not the only or most important factor in causing prices to surge in those markets. Even naysayers such as Capital Economics economist Paul Ashworth believes that surging house prices are not being caused by foreign investment but rather by Canadians taking advantage of cheap credit and relaxed lending standards. In fact, according to a range of reports and research conducted by a number of economists there is very little evidence to support the assertion that foreign money is driving up housing prices. According to an article from Canada’s National Post earlier this year, vacancy rates in Vancouver are on average 2% which then increases to 7.5% for condos, with very few of those vacant properties being foreign owned. The same article goes onto state that it is the laws of supply and demand that are responsible for higher housing prices rather than foreign money. Recent data from the B.C. government shows that between June 10 and June 29 only 3.3% of all real estate deals in Vancouver involved foreign nationals and as a share of sales by value they only amounted to 5.1% of all sales. This is a far cry from the figures to be expected from a market where foreign money is responsible driving property prices into a bubble. Indeed, if we take a closer look at the property markets of Vancouver and Toronto it is possible to identify specific market dynamics that are responsible for higher prices and these factors will continue to push them higher for some time to come. According to the naysayers, Canada’s housing market is now truly defying common sense and that a colossal housing crash is on its way, with the housing markets in Vancouver and Toronto caught in massive bubbles. This they claim is supported by factors such as Canada being judged to have the most overvalued housing market among developed economies and that global investors are increasingly betting against Canadian housing in record numbers. Housing bubbles do not exist in Canada, . . . If we turn to what defines an economic or market bubble it becomes apparent that Dunning could certainly be right. For a housing bubble to exist people have to be buying houses for purely speculative reasons and this has to be across a considerable portion of the market. Then to illustrate that a bubble exists there has to be expectations of self-fulfilling price growth and that those unrealistic expectations are leading to increased and excessive activity in the housing market. The theories postulated by Nobel award winning economist Joseph Stiglitz also supports these notions, he defines a bubble as where the reason that the price is high today, is only because investors believe that the selling price will be higher tomorrow. None of these factors in their entirety apply to Canada’s housing market nor those of Vancouver or Toronto. If anything it is far more mundane market specific factors that are driving housing prices ever higher. A group of academics from the University of British Colombia while proposing placing a tax on vacant properties in order to reduce the level of foreign investment in Vancouver have stated that the fundamental drivers of higher prices are higher demand and limited supply. Upon taking a closer look at the markets of Vancouver and Toronto this becomes very apparent. You see, Toronto and Vancouver are defined as global gateway cities that sees them cast in the same light as global cities such as London, New York, Paris and Hong Kong that have far more expensive real estate markets. This makes them important destinations for immigrants, with them accepting around half of all external immigrants to Canada. The reasons for this are predominantly economic with both cities, particularly because of the prolonged slump in oil prices, have the greatest concentration of jobs in Canada, with around 25% of total employment in Canada. And according to economists’ from Bank of Montreal these two cities accounted for all of Canada’s job growth in 2015. It is these factors which according to National Bank economist Stefane Marion are responsible for the working age population in Toronto and Vancouver to be growing at a rate that is 70% faster than the national average. The prolonged slump in oil has magnified this phenomenon, with the deep economic slump in Canada’s oil patch significantly impacting the economies of Alberta and Saskatchewan. This has not only made those regions less appealing to immigrants but triggered a marked uptick in the number of households seeking to relocate because of higher unemployment and falling wages. The supply of housing is rather inelastic, so in the short term house-price inflation is driven more by demand factors, such as the number of households, disposable income, interest rates and the yield available on other assets. In recent years all of these have helped to push house prices steadily upwards, especially in big cities. 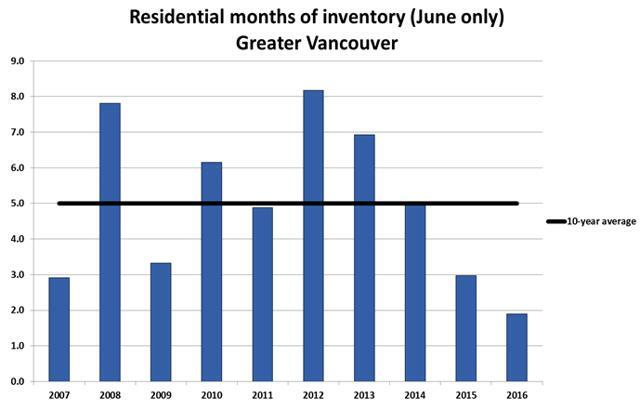 The constrained supply situation caused by limited inventories in both cities is easy to see. 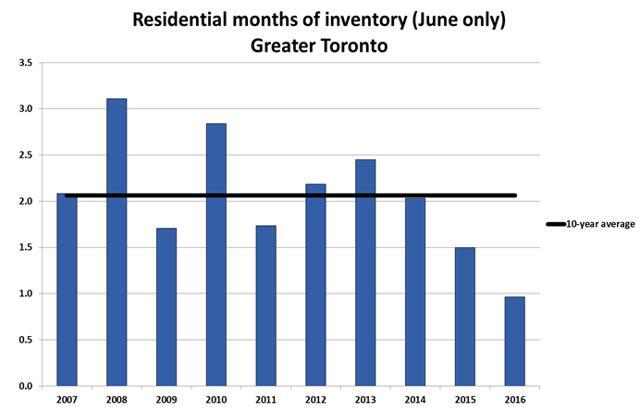 As the chart below illustrates, Toronto’s housing inventory by June of this year was at less than half of its 10 year average and a third lower than the previous year. Source: Canadian Real Estate Association. When turning to Vancouver it is possible to see that for the same period inventories are around 60% lower than the 10 year average and a third lower than a year earlier. With expanding populations, driven by growing internal and external migration, causing demand to swell coupled with extremely limited housing supplies in Toronto and Vancouver there is considerable support for higher prices, which means there won’t a correction in those markets anytime soon. One of the biggest myths concerning Canada’s housing market is that the conditions that exist are similar to, if not the same as those that existed in the U.S. in the lead-up to the massive housing meltdown that almost caused the U.S. financial system to collapse in 2007.
. . rising levels of Canadian household debt relative to income, along with rapidly increasing house prices, have created conditions similar to those in the United States prior to the financial crisis of 2008. Then there is Steve Eismann who rose to fame betting against the U.S. housing market in the lead-up to the subprime crisis. He is making similar claims to Moody’s but was doing so way back in 2013 and has been recommending that investors bet against Canada’s mortgages lenders and banks. It is this which has attracted the attention of short-sellers and now sees Toronto-Dominion Bank (NYSE:TD) and Bank of Nova Scotia (NYSE:BNS) being the first and third most shorted stocks on the TSX. However, there are a range of reasons why Canada is not a repeat of what was occurring in the U.S. back in 2006, key among these is far higher underwriting standards for loans and a distinct lack of subprime mortgages. It appeared that way back in 2006, anyone with a pulse could obtain a mortgage with mortgage underwriting standards relaxed to levels that were ridiculously low. Then there was the huge influx of fraudulent applications and an extremely lax approach to checking applications for accuracy. This easy money helped to fuel ever rising house prices and give a leg up to the next round of frenzied speculation. No one, from mortgage brokers, to the major banks wanted the merry-go-round to end as they all sort to cash in on the growing frenzy. Clearly, Canada has not reached this stage yet and in fact it is doubtful that it ever well, with its property market certainly not caught in the same type of speculative frenzy. Furthermore, it was the presence of considerable volumes of subprime mortgages that essentially precipitated the U.S. housing meltdown. It is estimated that they made up somewhere between 18% and 21% of all mortgages originated in the run-up to the housing crash. Whereas, in Canada subprime mortgages are estimated to make-up less than 5% of the market, and that was when the market was at its peak. With Bank of Canada pushing for tighter mortgage underwriting standards since this figure was released, it will certainly have fallen. lower loan-to-valuation ratios for non-insured mortgages. As a result, these differences mean that the market is not exposed to the same degree of risk nor the same volume of rapid defaults that forced U.S. lenders in 2006 and 2007 to flip repossessed properties as quickly as possible, causing prices to cascade ever lower. The differences between Canada’s housing market and that which existed in the U.S. in the run-up to the housing meltdown, which almost caused the U.S. financial system to collapse, are strikingly important. They highlight that not only is a sharp correction or housing meltdown unlikely but that in marked contrast to the claims of naysayers that there is in fact no evidence of a housing bubble. If anything while some regional markets are cooling, Vancouver and Toronto’s ever higher housing prices can be attributed to demographic pressures, higher demand and constrained supply. These factors will push prices higher in those markets for some time to come and backstop prices if there is a sharp economic downturn. For all of these reasons it is difficult to envision an epic Canadian housing meltdown occurring any time soon. This entry was posted in Housing Market, Uncategorized and tagged Canada, Canadian Housing Market on August 2, 2016 by Bone Fish.